Soup is a classic winter dish, and with good reason. It fills you up and warms you up at the same time. A lot of times I’ll made one big pot of soup that serves as our whole meal. That means filling it up with lots of protein so that it is hearty as well as healthy. 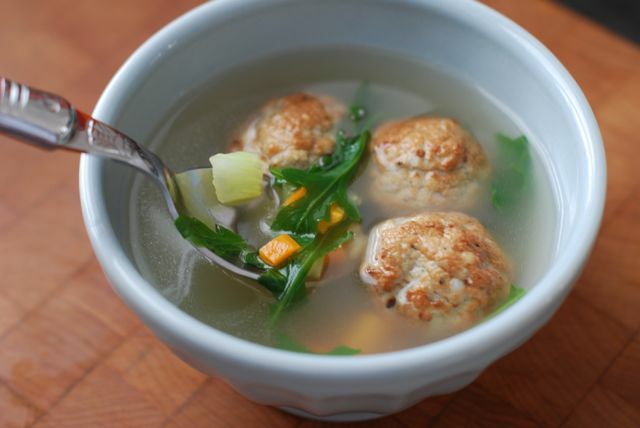 One of our current favorites is Italian wedding soup. It is a soup with a clear broth, pasta, herbs, and meatballs. It is the perfect combination of soothing and satisfying. With six more weeks of winter still on the horizon there is plenty of time to make yourself a big batch for lunch or dinner today! Step 2: Make the meatballs. Combine the ground chicken, sausages, bread crumbs, garlic, parsley, Pecorino, Parmesan, milk, egg, a large pinch of kosher salt, and a large pinch of freshly cracked black pepper in a bowl. Mash everything together with a fork and then use your hands to roll the mixture into 1¼-inch size meatballs. Step 3: Line the meatballs about 1 inch apart on a lined baking sheet and bake for 30 minutes, or until cooked through and lightly browned. Step 4: To make the soup, in a large pot heat the olive oil over medium heat, add the onion, carrots, and celery, and cook until softened, about 5 minutes. Then add the chicken stock and white wine and bring everything to a boil. Step 5: Pour in the pasta and cook for another 5 minutes, or until the pasta is cooked through. Then add the meatballs and spinach or arugula and cook until wilted. Taste for seasonings and add some extra salt and pepper as needed. Serve!